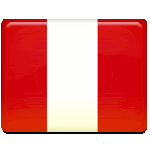 Independence Day is one of the major holidays in Peru. Celebrations last for two days and nation celebrates the day, when it became independent from the Spanish Empire. Argentinian general José de San Martín lead Peru through the War of Independence and declared it to be a free state on July 28, 1821. This is a very important day in the history of Peru, that is why celebration of Independence Day features numerous traditional events. During the whole month of July every home, public or private institution, office building, restaurant and school displays national flag. This tradition is obligatory, and everyone waits for celebration of Independence Day. Celebration of the holiday begins on the dawn of July 28, when 21 cannons salute the birth of independent nation. At 9 A.M. the mass, coordinated by the Roman Catholic Church, Te Deum begins. In the morning the Congress of the Republic of Peru invites President to give the traditional Address to the Nation. This custom was established by José de San Martín and its obligatory followed by every President of Peru. The speech of President includes points on development of the state, that was made during the year. Celebration of Independence Day is continued on July 29. Traditionally the Great Military Parade is organized on this day. The Peruvian Armed Forces and National Police participates in the parade.